Terpstra is still extending cartes blanches as he decided to ignore any wrongdoings on the part of the religion of peace, let alone that he will realise he isn't empowering the moderates, but on the contrary is leaving them in the lurch and at the mercy of radicals and fanatics! As we have already established in the preceding instalments, Geert Wilders - the M.P. intending to produce a film about the Koran, who stands accused by a Leftist Christian of being Evil for collating Islam with fascism - has Libertarian credentials, not Counter-Enlightenment ones. 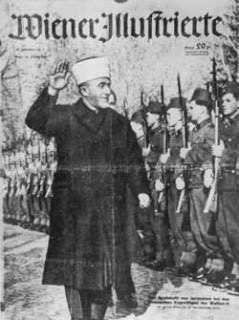 In the picture from the "Wiener Illustrierte" we see Amin Al Husseini, uncle of Yassir Arafat and Mufti of Jerusalem until 1974, inspecting a line of Bosnian Muslim goose steppers! There's been hardly a conflict during the last century in which the Mufti didn't have a hand, including the Turkish atrocities on Greeks, Assyrians and Armenians in the aftermath of World War I when Turkey fought on the German side. I am tempted to throw counsel to the wind and try my hand at the time-honoured style-figure of sarcasm with "other than that, there is no relation whatsoever between fascism and Islam", but that would leave wide open space for misconstrues (see our two part file on the subject "The Unholy Alliance: (National) Socialism and Islam", Part 1 and Part 2, filled to the brim with collations of Islam with Counter-Enlightenment ideologies). ... works against the notion of further educating himself. At this point the delusion plays it's best trick yet, turning the tables on what in Terpstra's mind are well-meaning, peace-loving fellow believers - Christians almost, but with rather different habits, whom we'd all come to appreciate if only we'd not be so fascist about it. So - in the mind of Terpstra - Wilders is Evil, Wilders and His Ilk must be Stopped! Even if they are the ones that require 24/7 state sponsored protection, which is all their own fault anyway! They know Muslims are an excitable lot, so shut up! The Dutch government - egged on by erroneous Christian Democratic notions of what constitutes 'civility' is using the same false arguments to shut up the native population and put the lid on 'free speech' - an derivative of Terpstra's rationale. All that is happening, as if there never were two traumatic political assassinations on behalf of the Muslim cause in the course of a few years. Pim Fortuyn was killed by a Leftist Narcissist nursing a perverted self-identification with what he experiences as 'the oppressed', while national enfant terrible Theo van Gogh was butchered by a Islamic Hirabahist. Contrary to the nebulous delusions in the mind of the Leftist Christians it is of course Wilders who is couragously staring reality in the face, who's indeed taking his responsibility as an M.P. towards society to expose evil where it lives, even if that means spending nights and weekends in protective custody or on heavily guarded Air Force Bases, away from his family. That there are decent, moral and civilized Muslims goes without question but they have been silenced by fear. Siggy, in a post titled, "Why I Hate Islam" talked about a friend: My friend believes in God, without equivocation, and my friend is outraged at the yoke that must be borne by true Muslim believers because of the disintegration of Islam. The shame of many - but not all, who go to mosques to pray, cannot be measured. My friend describes an unwritten code and language decent Muslims share, so that they might find each other. They are too frightened to speak freely and they are too frightened to stand up to the bullies that have taken over the mosques and Islamic schools. (...) Wretchard has this to say in a post about the "kinder, gentler sharia" that is evolving in Nigeria, which he calls "The Ecology of Tolerance": "The transformation of hard-line Islamic regimes into softer ones in places as diverse as Anbar province (Iraq) and Nigeria suggests that if the world wants to see a more "moderate" Islam, it is far more effective to support those who take a principled stand against it's excesses than to pander to it's most extremist elements. Ironically, the West's disgusting groveling during the Danish cartoon riots and on many subsequent occasions may have done nothing to attract the "moderates" in Islam. Those moderates would have been far better empowered if Western leaders had told the radical theocrats to shove their demands, lashes, cutting knives and fatwas where the sun don't shine." As I wrote in a previous post, the strategy of these 21st century barbarians is to use the tolerance and goodwill of the West for the very purpose of destroying civilization and implementing intolerance and ill will (i.e., sharia) in its place. So, I say without any humor intended, behead the enemies of Steyn. Wipe them off the map of civilization; and stop agonizing over hurting their feelings or doing something they won't like us for. They already don't like us. And they like us less each time we show them our weaknesses. Death or submission is what they have in store for us; they been saying it clearly and unambiguously for several decades now. They don't need to think we're wonderful. When they respect us and understand that we mean what we say when we say, "Enough! ", they may actually learn that tolerance is in their best interest. It is not in our best interest to hear no evil, see no evil and speak no evil.